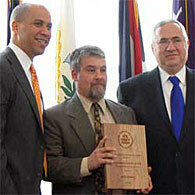 Award: Scenic Hudson's Rich Schiafo accepting an award from the EPA. The EPA presented its highest accolade to PCB project manager Rich Schiafo for helping accelerate a PCB cleanup. Long delayed by GE, project construction is finally underway. Morning: Enjoy a spectacular mountaintop—and a bluegrass breakfast—at Gateway to Mount Beacon Park. Noon: Be our guest for a waterside picnic and family-friendly activities at Esopus Meadows Park. Late afternoon: A special finale at Poets’ Walk Park. Make sure you get your invitation—sign up for a FREE Scenic Hudson membership. May 15, 2007 - Whether it's a local or statewide issue, voter initiatives present important opportunities to exercise your democratic rights and to advance your green agenda. (HYDE PARK, New York)—Officials from the National Park Service (NPS) and Scenic Hudson led a ceremony today celebrating the transfer of a large parcel of land to the NPS to be added to the FDR National Historic Site. The wooded 334-acre parcel contains the historic farm lane that links the Roosevelt home Springwood and Eleanor Roosevelt's Val-Kill. Once again visitors will experience the property as the Roosevelts did and connect with land that was very personal to one of America's great families. (YONKERS)—Scenic Hudson, the City of Yonkers and developer Collins Enterprises have agreed to modifications on a riverfront development that will allow residents to enjoy even more of the city's Hudson River shoreline.